Schwerin Palace, seat of the Landtag, is one of more than 2000 palaces and castles in the state. Mecklenburg-Vorpommern is one of the 16 States of Germany. The capital is Schwerin. As of 2016, Mecklenburg-Western Pomerania had about 1,612,000 people. It made part of former East Germany. It is the most northeastern state of Germany. It borders the Baltic Sea in the north, Poland in the east, Brandenburg in the south, Lower Saxony in the southwest and Schleswig-Holstein in the west. Mecklenburg-Western Pomerania is low-lying and has many rivers, canals and lakes. The Stettin Lagoon lies partly in this state and partly in Poland. The state hosts the biggest German island called Rügen, and the second biggest German lake called Müritz. Besides Rostock all have a population of less than 200,000. Schwerin, the state capital, is the smallest state capital in Germany. 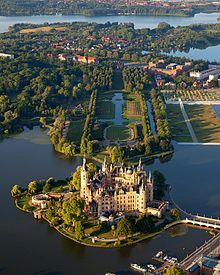 Usually Schwerin would not be called a city. In Germany a city has over 100,000 people. Mecklenburg-Western Pomerania was going to change the borders of all of its urban districts (towns) and rural districts (kreise or "counties"). The state supreme court stopped the changes. Wikimedia Commons has media related to Mecklenburg-Vorpommern. ↑ "State population". Portal of the Federal Statistics Office Germany (in German). Retrieved 2007-04-25. ↑ With the abolition of states in East Germany in 1952 vehicle registration followed the new Bezirk subdivisions. Since 1991 distinct prefixes are specified for each district. ↑ "Regional GDP per capita in the EU28 in 2013". Retrieved 2015-09-10. This page was last changed on 10 March 2018, at 08:41.